When I work with younger people, I’ll usually give them my cell number so they can text me whenever they want. Texting is just so much less stressful and easier for those of us who grew up with cell phones, and it seems to be a comfort for the families when they know they can reach me via text anytime of the day. 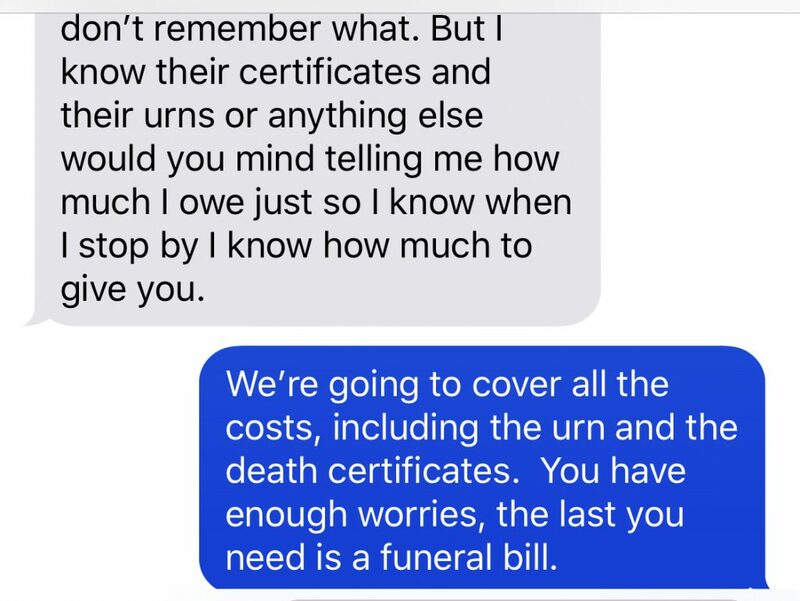 This is a text exchange I had with a young mother who birthed stillborn twins. And I don’t share this to brag about my supposed sainthood in providing a free funeral to a bereaved mother. It’s the opposite really. Saintliness implies something extra good, or extra human, or god-like. This act was very much just basic, normal humanity. This is nothing exceptional. 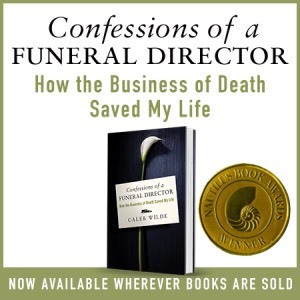 Most funeral directors enter and stay in death care because we’ve experienced death and want to use our experience to help others who are experiencing the same. The best of us are grieving people helping grieving people. Every funeral director I know heavily discounts, charges cost, or gives both services and goods for free when their “customer” is a child. It’s not a rule we were taught in funeral school. It’s not unspoken code. It’s just human. And I guess I want you to know that death care workers are not saints, and unlike the many stereotypes, most of us aren’t sinners out to exploit the grieving public. We carry the same grief you do, and we know how far a little goodness and grace can go. So next time you see us in real life, or portrayed as a charlatan on TV, know that we’re neither saint or sinner. We’re very much like you . . . and just like you, when we see a grieving mother, we do what anyone would do by giving the best we can give. This entry was posted by Caleb Wilde on November 12, 2018 at 8:14 pm, and is filed under Death of a Child. Follow any responses to this post through RSS 2.0.You can leave a response or trackback from your own site.